Engineered Restorations, Inc. : ICE Building Receives Facelift | Engineered Restorations, Inc. 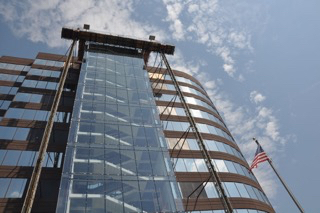 Engineered Restorations helped in the renovation and staircase addition to the Intercontinental Exchange (ICE) corporate headquarters building in Atlanta. The glass curtain wall was modified to incorporate an exterior exposed staircase for increased movability between floors. ERI applied proven methods and expertise for a water-sealed transition from the old to the new. Exterior entrance areas including the entrance stairs and paver patio systems were replaced providing an updated look that brings the building up to speed with this explosive technology based company.